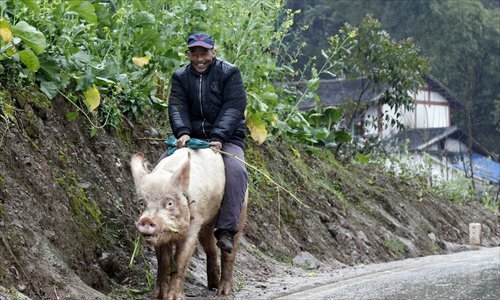 An elderly pig farmer has been turning heads on the streets of Southwest China's Chongqing for riding a humongous hog ever since he became too sick to take long walks. Jiang Chengyou, 68, of Huilong village in Dianjiang county, has become a local celebrity for cruising around town on his gigantic 3-year-old swine, which weighs more than 250 kilograms and is nearly 90 centimeters tall. A pig farmer for 30 years, Jiang got the idea to ride the pig a few months ago after enduring a bout with bronchitis, which has since made long walks very difficult. "Riding my pig saves me a lot of energy and is also quite fun," said Jiang.